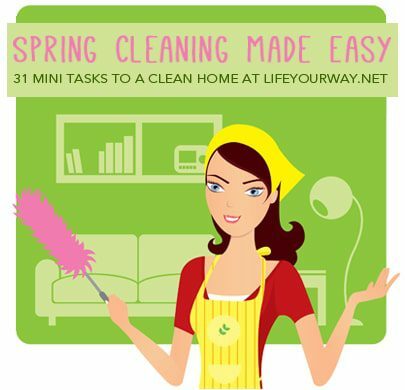 This month we’re spring cleaning the easy way with our Spring Cleaning Made Easy series! The goal is to get the whole house clean — one mini task at a time — without having to set aside a whole week, or even a whole day, to clean. If you’re just joining us, you can jump in with today’s task or start at the beginning, whichever you prefer! Ah, toys. They’re definitely the biggest source of clutter in our home, even though we clean and organize them regularly! Gather all the toys in one place so you can deal with everything at once, which makes it easier to make decisions about what to keep and what to give/throw away. Throw away any broken toys or sets and games with a significant number of missing pieces. Give away toys that your children have outgrown. Limit the number of items in any given set to what can fit in a single container. The size of the container will vary depending on the item (stuffed animals versus matchbox cars, for example), but pick a container that seems reasonable and then let it be your guide. Have your child choose 3 toys to give away to someone in need. 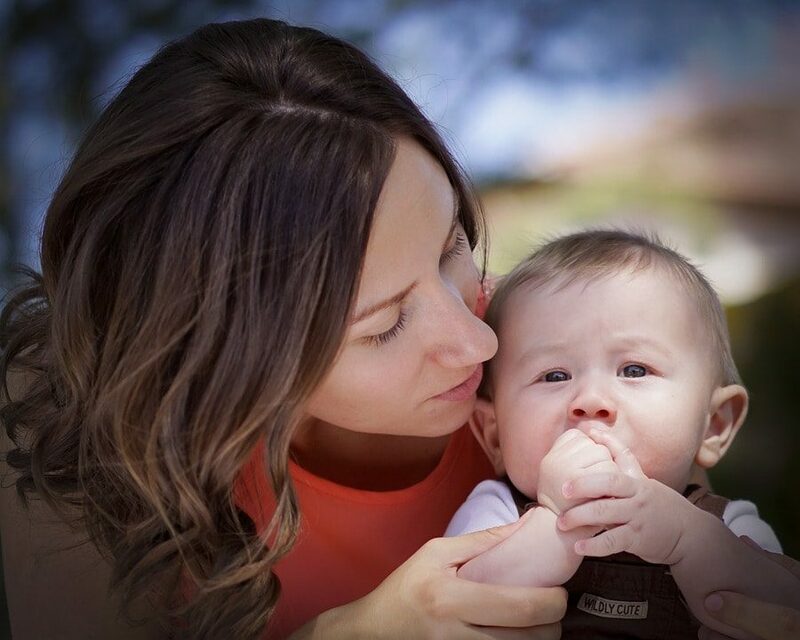 I’m a huge proponent of involving them in this process, both so they can learn charity and so they can practice organizing and decluttering from a young age. Start by putting away the largest toys and then — if your home is anything like ours — begin sorting the little toys into piles. We always find random Little People, Littlest Pet Shop animals, marbles, game pieces, etc. mixed in with the other toys, and I’ve found that it’s much easier to sort those into piles first and then put them away rather than trying to put things away one at a time, which can take forever. Put everything away! If your cabinets/closets/shelves are overflowing, consider going back and choosing more toys to give away or at least pack away for a season. I think you’ll find that your children actually play better and more creatively with fewer toys — at least that’s true for us! You can see our process in action in this (very old!) vlog, featuring my oldest two when they were just itty bitty! Track your progress this month with the Spring Cleaning Made Easy checklist, which comes in two versions — one with dates to coincide with the live series and one with generic labels so you can do it on your own at another time. Click here to download or print your copy! Don’t feel like you have to finish this one all in one day; we’ve also set aside tomorrow to finish organizing the toys! How do you control the toy clutter in your home? 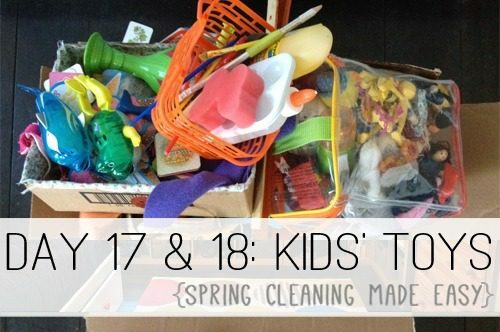 How often do you have to clean out and organize the toys?